Godmin is an admin framework for Rails 4+. It helps you build dedicated admin sections for your apps, or stand alone admin apps such as internal tools. It has support for common features such as scoping, filtering and performing batch actions on your models. Here at Varvet we’ve used Godmin to build admin sections for our clients over the past two years. The first version of Godmin was extracted from an application that helps priests plan their services (yes) hence the name. Every feature since has been added because of a real world use case. We started out, like many others, using ActiveAdmin. But building tailored admin sections for our clients was difficult. We were more comfortable using standard Rails controllers and views than configuring the ActiveAdmin DSL. 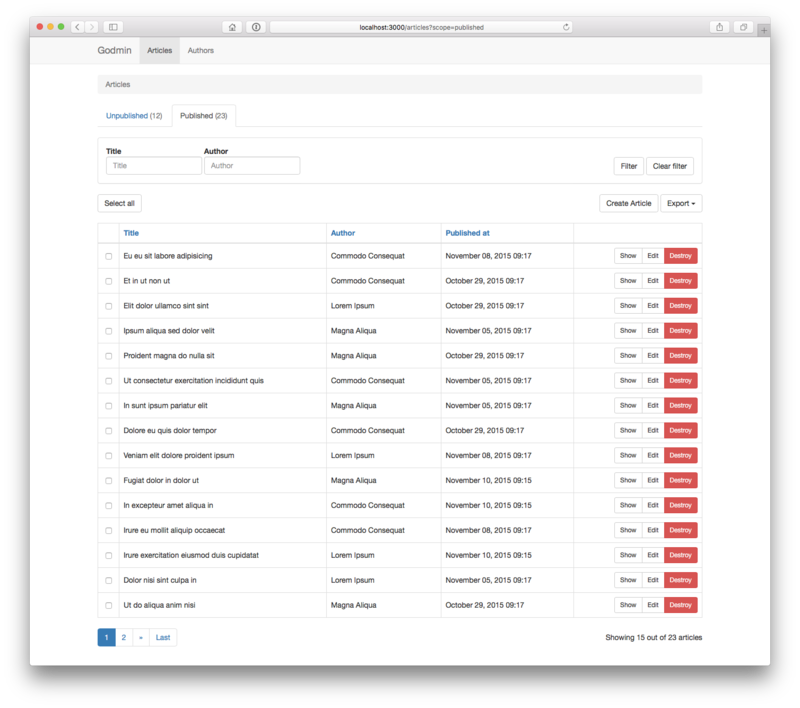 We wanted admin sections to be regular Rails apps, or engines, with regular routes, controllers and views. That’s why we built Godmin. Easy to override default behavior using conventional Rails techniques. Opt-in modules where it makes sense. Not everything is included by default. Godmin is not an isolated engine. You can generate your own isolated admin engine and use Godmin from there, or use it from the main application. No forced inheritance. You are free to inherit from your own classes. All Godmin functionality comes from modules that you include. Additional features are available as plugins, such as a file upload component using refile and a rich text editor component using redactor. Interested? Try the demo app or head over to GitHub to check out the code and documentation. If you have any issues or feature requests, please post an issue at GitHub!